By now, chances are most of you out there have already heard about Sanyo’s Eneloop batteries – those super durable rechargeable batteries that can work right out of the box, and are full well capable of retaining a charge of up to 85% even after a year in storage. 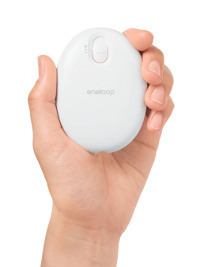 Capable of being recharged up to a thousand times without losing any of its potency, Eneloops have fast become a popular choice for those who use devices that require AA, AAA, C and D batteries (thanks to the use of battery adapters), especially for digital cameras and remote control toys. Well, we have yet another device from the Sanyo Eneloop stable this time round known as the Eneloop Kairo – a portable rechargeable hand warmer. This sleek and stylish hand warmer arrives in the US market just in time for the bitter winter (in some states anyways), featuring an egg-style, one-sided design. Also known by its model number KIR-SE1S, you can choose from white or pink colors for the one-sided warmer, while those who prefer a double sided Eneloop Kairo (KIR-SL2S) can choose from silver or pink colors. Looks like you more or less have yet another candidate for a gift idea this Christmas, eh? Both models will be available via select retailers in the US, while you can also purchase it via an online Sanyo store (sanyostore.com) sometime later this month onwards. The one-sided KIR-SE1S is tipped to retail for $34.99,while the two-sided KIR-SL2S hand warmer is a wee bit more expensive at $44.99. You can juice up the Eneloop Kairo for up to 500 times before it starts to lose its charging effectiveness, and your mittens will always remain nice, cozy and comfortable as you can choose from different levels of heat ranging from 102 degrees F in the low setting to 109 degrees F in the high setting. It takes around 3 hours to charge it up to the maximum, where a low setting will deliver up to 4 hours of warmth.